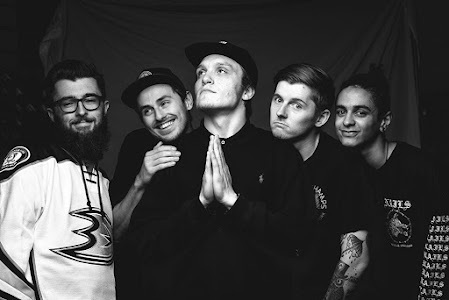 We are delighted to have an interview with Fil Thorpe-Evans, bassist from Neck Deep, a pop punk band from Wrexham, UK. The band was formed in 2012 and got the Kerrang! Music Award – Best British Newcomer in 2014. They have just been on Warped Tour. 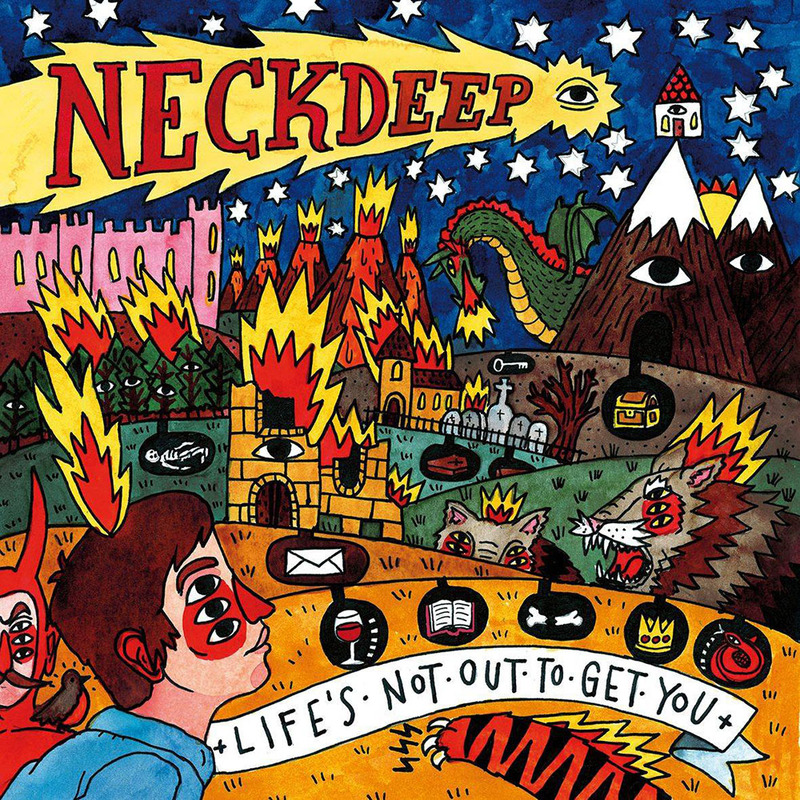 And there is a huge, catchy, diverse album coming up on 14 August 2015, named Life’s Not Out to Get You. Headbangers must be wondering what riffs they are going to present to the world. 1. 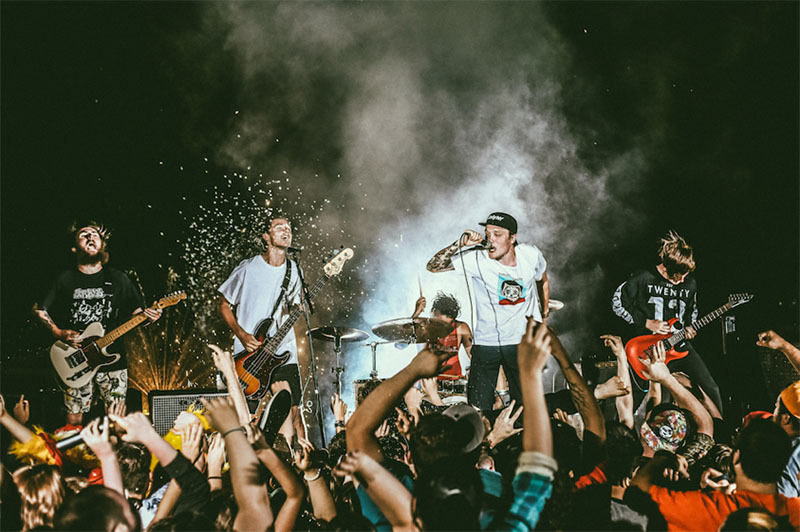 During the Warped Tour, have you spotted any differences between performing in the UK and performing in America? They are slowly becoming more and more alike in my opinion. The UK was slower to the draw in terms of crazy shows and things like stage diving and crowd surfing, but I love performing in both places. 2. How would you say the band’s sound has progressed from ‘Wishful Thinking’ to ‘Life’s Not Out to Get You’? I think we have progressed a huge amount musically and that really shines through in the new record. I feel like it’s so easy to hear the the progress we have made as soon as you hear the first few tracks in fact. But we are still sticking to what we know and love and that’s throwback vibes pop punk. 3. If you could perform a headlining act anywhere in the world, where would it be and why? For me personally, it would probably be headline at Milton Keynes Bowl in the UK. I don’t even know if that venue exists anymore but I saw Green Day play there when I was like 13 and it was a really big moment for me. It holds something insane like 70K people so it would be kinda funny haha. 4. Which band/musician is your biggest inspiration or idol? For me its Blink 182 and has always been, always been such a huge fan and I think I always will be. 5. In the music video for your latest single “Can’t Kick Up the Roots”, it has clips of you guys around your hometown hanging out with the friends. Was what was caught on camera, things that you’d actually did before the band? Absolutely, I had the camera guy meet me in my home town with me and bunch of my old friends ready to hang and he just said ‘take me to your spots’ and we literally just hung out at all the same places I used to hang out growing up. It’s very authentic. 6. Since you guys were on Warped Tour, have you met any bands that you’ve bonded well with or have given you some solid advice? We have a lot of bands that we love to hang with and bond with but as for advice, probably Joe B from Transit. That guy has a lot of wisdom and sees the world in a really inspiring way. 7. How did it feel to be opening for All Time Low at Wembley Arena? It was amazing! I’ve seen so many shows there growing up so it was really amazing to be able to play the stage. Always wanted to do an arena show so ticking it off the bucket list was awesome. 8. If you could combine with any band and make a supergroup which band would it be and what would you be called? Seaway, and we would be called Sea Deep. 9. Please describe your upcoming album ‘Life’s Not Out to Get You” in 5 words. Huge, Catchy, Riffs, Diverse, Headbang. 10. What is your favourite / most meaningful lyric (from any song)? It would defo be from the new album and we can’t post that yet so I gotta keep quiet on that one. 11. If you could represent the band with one emoji, which emoji would it be? The little pile of poo guy. 12. What is the coolest gift that you’ve ever received from a fan? Our fans our incredible and have brought us some amazing things but when someone brings something super personal to you because they know you would love it, that’s amazing. Anything Office related for me. 13. Where do you see yourselves in 10 years time? Headlining a huge ’10 years of Neck Deep’ tour. Hopefully playing to more than 5 kids that remember us. 14. 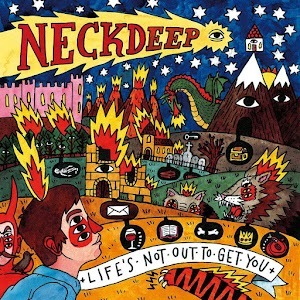 The artwork for “Life’s Not Out to Get You” is really impressive. What’s the concept behind it? It tells the story of the record and the songs concepts in many ways. I think it’s a beautiful piece of art and I’m so stoked on how it came out.